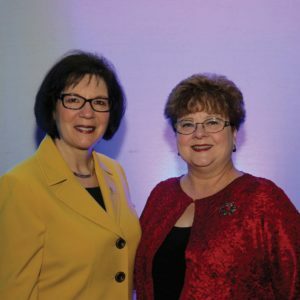 Cathy Catrambone, PhD, FAAN, left, with Sheila Ridner at the International Nurse Researcher Hall of Fame induction ceremony. Sheila H. Ridner, PhD’03, MSN’00, FAAN, the Martha Rivers Ingram Professor of Nursing at Vanderbilt University School of Nursing, joined an exclusive group of acclaimed researchers in July when she was inducted into the Sigma Theta Tau International (STTI) International Nurse Researcher Hall of Fame. Induction into the International Nurse Researcher Hall of Fame is considered one of the highest honors in nursing. It recognizes nurse researchers who are deemed particularly esteemed by colleagues and the profession and is awarded to those who have achieved significant and sustained national or international recognition for research that has improved the profession and the people it serves. Ridner’s pioneering work on lymphedema — painful and sometimes dangerous swelling caused by retained fluid in the lymphatic system after cancer treatment — has led to worldwide standards of care for the more than 140 million lymphedema patients across the globe. Her research and development of potential treatments focus on early detection and self-care, and have the potential to improve quality of life for cancer survivors diagnosed with lymphedema. She is internationally known as a scientist and expert on lymphedema and lymphatic research. The principal investigator on several active studies, Ridner has received more than $14 million in research grants from the National Institutes of Health, American Cancer Society and Vanderbilt University, and Tactile Medical and ImpediMed, medical device manufacturers. Ridner serves as the director of VUSN’s PhD in Nursing Science program and is known for her mentorship of other nurse-researchers. She is also a member of the Vanderbilt-Ingram Cancer Center Scientific Review Committee. This entry was posted on Monday, March 12th, 2018 at 8:51 pm	and is filed under Departments, Issue, News Around the School, Spring 2018, Vanderbilt Nurse News. You can follow any responses to this entry through the RSS 2.0 feed. Both comments and pings are currently closed.